Suburban St. Louis is where I reside. Printmaking and oil painting are a passion and I move from one to the other to explore a new technique, or develop a new subject matter. This ability to work within the two medias supports my evolution as an artist. I have been interested in all forms of artistic endeavors for as long as I can remember. Early on, while learning printmaking techniques in high school, that creative activity became almost all-consuming. I bounced around a bit during my college years. 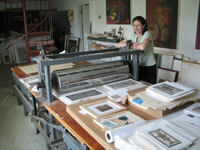 I began studying art at the University of North Carolina at Greensboro and then received my BFA from Washington University in St. Louis where I also learned printmaking techniques including lithography, block printing and etching and was later introduced to collagraphy. 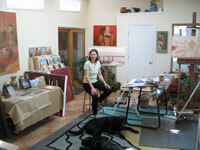 For many years my painting and printmaking work focused on still life subject matter. The work was predominately composed with pottery and mirrors so that the reflections and inter-relationships of color and spaces were explored. Color, pattern and form have been all important in my work. In 2009, over a six-month period, I decided to experiment with a painting a day. At this time I ventured into using rural landscapes as subject matter. These paintings were primarily inspired by photographs taken by my sister, Kathryn. It was great fun and I figured out that moody, misty, snowy compositions were really what I was most drawn to. It was also a nice change from very exacting work of creating compositions using pattern which you can see in much of my still life work. 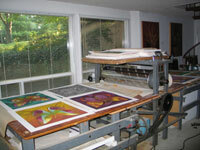 Collagraphs and monotypes are the two forms of printmaking I am concentrating on right now. Using the technique of monotype is truly rewarding since it combines my love of painting and printmaking. Because this process is so spontaneous I never really know what to expect and often I will be surprised. My approach to collagraphy has changed dramatically over the years and continues to evolve. The new subject matter (birds, dogs, cats, etc.) I have been working with in my latest collagraphs applies some of the basics I learned in college, while at the same time adding a contemporary feel. As anyone who has done a collagraph, developing a three-dimensional appearing image is a considerable challenge. In the last 20 years I have exhibited my work in numerous major cities and have been included in many corporate collections. A sampling of these collections include: Allied Signal Corp., Cigna, Citicorp, Marriott Corp. and PepsiCo, Inc. Click here for a more complete list.